I was really shocked earlier today when I heard that Michael Todd, GMP Chief Constable had died whilst walking on Snowdon. 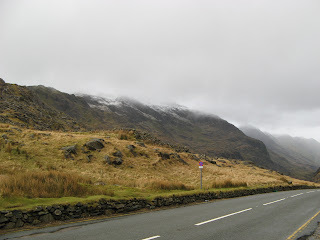 He died at Bwlch Glas, which is the top of the PYG Route, ab0ut 80 ft below the summitt of Snowdon. Exactly where I was less than 24 hours earlier. I was going to put up a blog post with some of my photos anyway, but now this post is a tribute to all walkers and climbers who have lost their lives on the mountains. Long may we love the mountains, climb them, and come back safe. 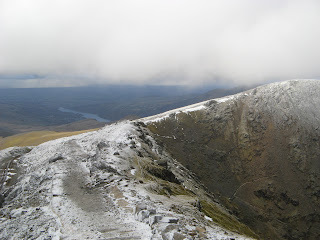 Looking NNW from the Summit - this is the way the weather is coming in from, very windy and slippy underfoot because of the snow and ice. This is my favourite photo - equally wild and beautiful. Crib Goch from just below the Summit, you can see the PYG Route zigzagging up the hill and the lakes in the distance. Next morning from Pen-y-pass, after hearing the wind howling in the night, the other side of Crib Goch and the first part of the PYG Route, taken in between showers of rain. The day before you could see the top from this side and no snow! 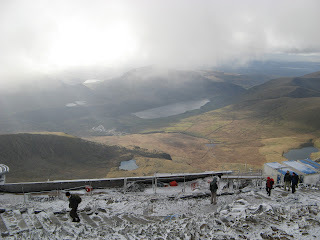 This was my first time up Snowdon, but I don't intend it to be my last. Any old iron - well copper actually..